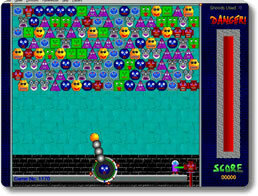 Snood Game - Download and Play Free Version! Launch the Snoods from Your Cannon and Thin Out Their Numbers! The Snoods are Coming! The Snoods are Coming! Pack your stuff and run for the hills. The snoods have their sights pointed in your direction and they have no interest in changing course. Fortunately, though they are numerous, the snoods do have one weakness; if enough of the same color are paired together, they’ll vanish instantly on the spot. No one knows where they go, but that’s not important. All that matters is that you just might be able to save yourself. Shoot snoods from your cannon, match as many of them together as you can, and obliterate them en masse. If you succeed, then you will live to face even greater challenges. However, failure will result in being up to your armpits in snoods. In the past, you’ve likely matched all sorts of things together, from precious gemstones, to bubbles, to runic hieroglyphics, and so on. How many times have you been given the opportunity to match actual people together? That’s what you’re going to be doing in Snood. Snoods come in all shapes and personalities; there are your cool blue circles, your cocky orange sunglass-wearing hexagons, your loveably dim-witted green squares, and more. Snoods have character. Watch as they alter their expression every time you launch another one at the crowd. Play on five levels of difficulty: Child, Easy, Medium, Hard and Evil. Create your own custom games where you set the rules. Aim your gun carefully at the mass and see if you can chain at least three matching snoods together. Bounce snoods off of the walls to make even more difficult shots. Take out all of the above snoods to cause the lower ones to drop off the screen entirely. Clear out all snoods to complete the level and advance to the next one. Learning how to play Snood is easy. Mastering it is a whole other matter. There are all sorts of difficulties and obstacles in the way that will make your snood-matching days just a little trickier. Beware of the Danger Meter. If you let it fill up without taking out enough snoods, then they’ll sink lower to your position. If just one of them hits the bottom of the screen, it’s game over for you! Look out for Numbskulls. These skull-shaped snoods can’t be fired from your cannon and thus can’t be matched. If you want to get rid of them, you need to clear out everyone they’re clinging to first. Wake up sleeping snoods. They won’t know they’re supposed to disappear when matched up until you hit them with something. Not all snoods are out to make your life miserable. Some of them can make things just a little bit easier for you, provided you’re smart enough to use them strategically once they’re loaded up. Launch the jester-like Wildcard Snood to create a match with snoods of any and every color. 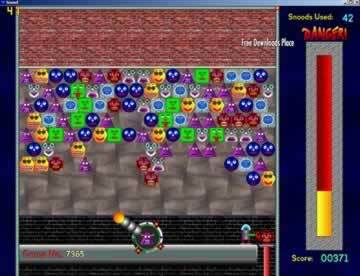 Fire the Stone Snood to destroy any adjacent snood he sticks to. Shoot the diamond-shaped Rowbuilder Snood to create a whole new row of snoods that match whichever one it hits. Snood is a simple puzzle game that requires a steady trigger finger, a sharp eye, and a lot of strategy to beat. It also has a lot more personality and quirky humor than you’re probably used to seeing in this genre. It all combines to form an addictive experience that really should not be missed. See what all the fuss is about and check out what Snood is today!